Plans by OMA and West 8 for the Commonwealth Institute in west London have been released. 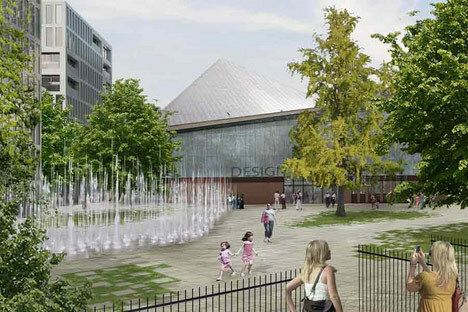 As shown above, the long-empty building would benefit from a comprehensive redevelopment, with the flagpoles and covered walkway out front replaced by water fountains, a new 9,300 square metre home for the Design Museum, new housing units up to nine stories tall, and much of the building's interior stripped out to create a central "void", offering prime views of the building's distinctive roof. In fact just about only thing untouched is the roof, a point that has irked the Twentieth Century Society, which said it was "dismayed" that the project sees fit to discard so much of the original 1962 design. The planning application admits that the Society remains "far from convinced", and the same can be said of Kensington & Chelsea's Architectural Advisory Panel, which is concerned about the "scale" of the new residential buildings. A public consultation will run until May 22, and full details of the proposal can be viewed here.